Social media has been humming with reports that the highly regarded Sistem51 by Swatch will be released in a steel case series as part of their ‘Irony’ collection. Swatch yesterday confirmed with TwentyTwoTen that the reports are true and we’ll see a release as early as September 2016. Update 26/8/2016: Sistem51 is now available at the Swatch online store. Update 23/08/2016: Swatch have confirmed that the Sistem51 Irony series will be available online on 26th August 2016 and in-store 8th September 2016. 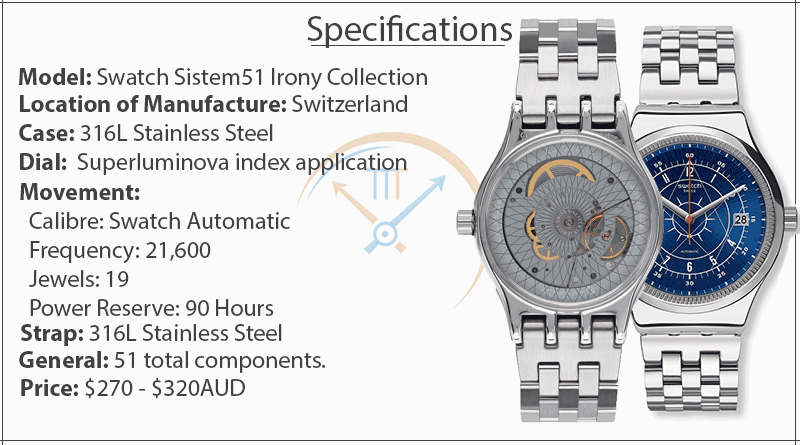 T he Sistem 51 series was originally announced in 2013 to monumental fan-fare; the first entirely machine made automatic Swatch comprising of just 51 parts. The first quartz Swatch also comprised of just 51 components back in 1983, which ultimately set the target for Swatches mechanical movement. Three years later we see the pending release of the Irony series of the Sistem51, which takes the revolutionary “automatic watch for everyone” and gives it some significant upgrades, cementing itself in the affordable, sophisticated, everyday wear category. The automatic movement is the first to be manufactured via a fully automated assembly line and consists of just 51 individual components. This process is yet another sign of how the Swiss watch industry continues to reinvent itself to meet the needs of the market and economic climate. The watch boasts an impressive 90 Hour power reserve, 17 pending patents and just a single central screw. The movement is both automatic and manual wind. Swatch has upgraded their previously silicon strap to a rubber on the Sistem Arrow version of the Irony collection which currently comprisis of six unique models and a seventh (the SISTEM STALAC Model No. YIS406G ladies edition) to be released at a later, unconfirmed, date. Consistent with the price-point, the Sistem51 will not be serviceable; a polarizing point among the watch community. Swatch understandably advise that it is more cost effective to simply replace the piece. This sure-fire sucess looks to be the start of a long line of affodardable mechanical movements from the Swiss watch giant and at an RRP of $279 – $320AUD – how could you say no? ← Questioning the Chronic Unease in the Swiss Watch Industry.